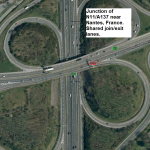 French motorways: 4 ways to improve. 1. Shared joining and exit lanes. It is common on urban motorways in France that the traffic leaving a motorway and joining the motorway shares the same deceleration/ acceleration lane. 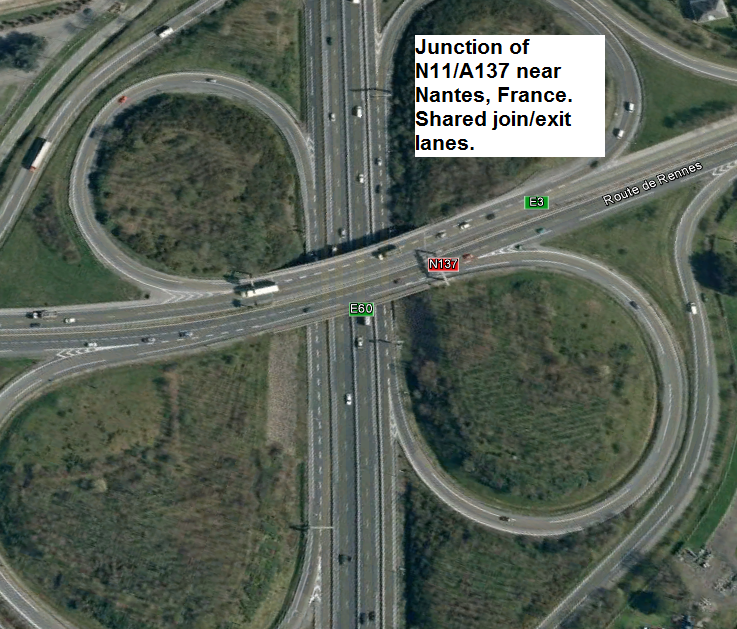 In other words the exit lane leaving the motorway is shared by traffic on it trying to join the motorway. I think there are much better and safer ways of handling this situation. Below is an example of this near Nantes. 2. Short off ramps. The lanes joining or exiting the motorways can be short in length. This allows less time to accelerate to match the speed of traffic of traffic already on the motorway or to slow down when exiting. 3. Steep gradients. The maximum gradients on French motorways are quite steep compared with Irish roads. 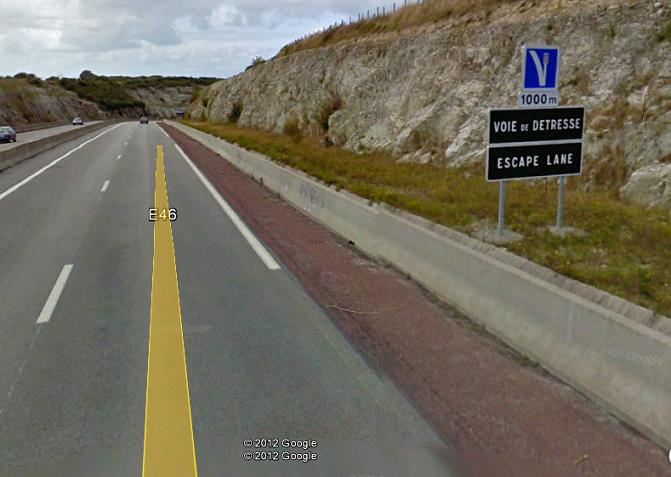 The maximum gradient that I experienced was 6% (noted on road side signs) near Cherbourg. As a result of these steep gradients precautionary emergency escape lanes, with sand traps at the end, have been constructed in places to stop trucks whose brakes might have failed (presumably through overheating). Surely it would make more sense to construct roads with shallower gradients. To be fair though climbing lanes were provided in all cases where I experienced steep gradients. French M-Ways: Escape lane on steep hill. 4. Aggressive driving. In my experience drivers on French motorways are much more aggressive. They drive much faster and closer to other vehicles. This seems to result in more serious car accidents. I have spent relatively little time driving in France, but I have caught sight of more upturned cars after car accidents on French roads than in all my time driving on Irish roads. But there is one advantage to this behavior; people do not misuse the overtaking lane as they do in Ireland. Once they have overtaken they will return immediately to the driving lane.